The biggest stylistic addition to the palette of the Donkey Kong Country 2: Diddy’s Kong Quest soundtrack is the much larger presence of orchestral pieces. Wise isn’t often thought of as an orchestral composer, but his work here shows his undeniable talent in this area. Determined and driven, map theme “Welcome to Crocodile Isle” could hardly be more different from DKC’s “Simian Segue”’s sunny demeanour. Clearly, the stakes have been raised and it’s not just the game’s sombre colour palette that is telling us so. 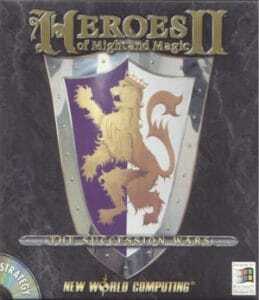 Most impressive of all is “Krook’s March”, as multi-faceted and sophisticated as any top shelf SNES JRPG composition. Its opening references “K. Rool Returns”’ theatrical mood, but soon enough Wise lets the orchestral drama disintegrate into a surprisingly lean passage for solo bassoon against string pizzicati and glockenspiel. Despite the fluidity of its orchestrations, the composition’s structure remains admirably coherent. These confidently expressed dramatic gestures particularly benefit the boss tracks. 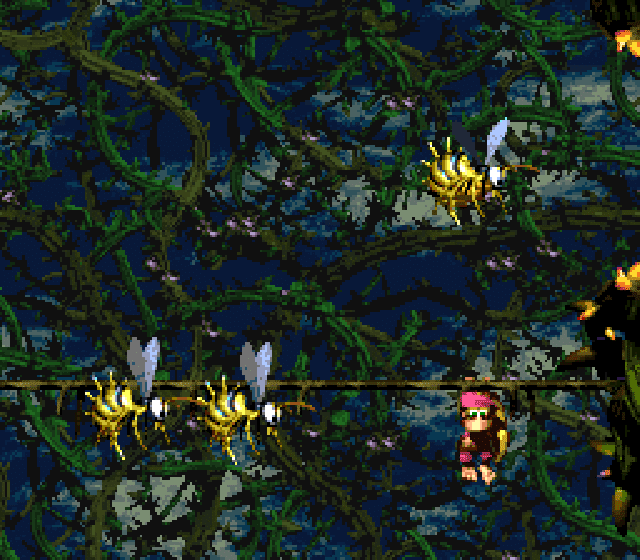 On Donkey Kong Country, they were the soundtrack’s weakest link, repetitive and heavy-handed. On the Donkey Kong Country 2: Diddy’s Kong Quest soundtrack, these tracks largely maintain the score’s level of excellence. “Boss Bossanova” mixes K. Rool’s theme from “K. Rool Returns” with a sea chantey mood that feels entirely appropriate. “Crocodile Cacophony” equally relies on the antagonist’s theme, which ends up being the soundtrack’s most prominent thematic construct. Here and elsewhere on this score, Wise pushes the SNES sound chip as hard as one could possibly imagine. The metallic percussion on “Crocodile Cacophony” couldn’t sound anymore heavy and forceful on this platform. 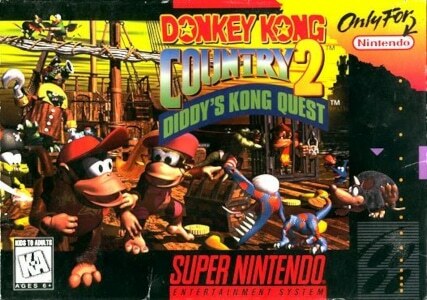 Ultimately though, what has made the Donkey Kong Country 2: Diddy’s Kong Quest soundtrack a fan favourite is its continuation and expansion of Donkey Kong Country’s soundscaping. On that earlier game, many of the level themes had a beguilingly stark mood. The stage tracks on Diddy’s Kong Quest are less hypnotic, but arguably more immediately accessible – and just as memorable. Take “Stickerbush Symphony”, inspiration to many electronic music artists and the reason why a decades-old SNES soundtrack still receives coverage in mainstream music publications, including the Rolling Stone (even if that coverage isn’t always very well-researched). Originally written to accompany an underwater level, “Stickerbush Symphony” arguably doesn’t deviate much stylistically from DKC’s “Aquatic Ambience”. Both compositions are portals to a soothing world of gently morphing synthscapes and wistful melodies gliding on top of ebbing and swelling electronic pulses. But “Stickerbush Symphony” puts greater emphasis on its melody, a call-and-response pattern that ranks among the SNES’ best melodic ideas. And so it goes on the entire Donkey Kong Country 2: Diddy’s Kong Quest soundtrack. 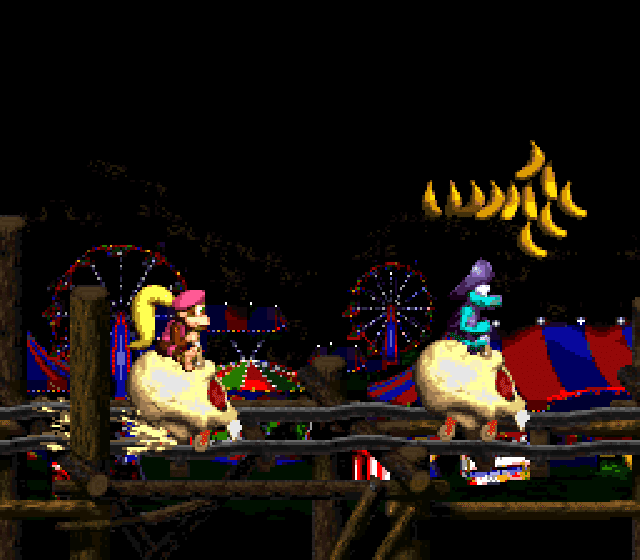 While maintaining aspects of DKC’s ambient nature, the level themes are now more strongly guided by melody progressions rather than hushed explorations of moods. “In a Snow-Bound Land” manages to rival “Stickerbush Symphony”’s emotional impact. Its light pop feel only makes the yearning character of its ethereal melody lead more immediate and touching. The track’s treble-heavy orchestration offers few surprises, but as always, Wise shapes the instrument sounds magnificently. Indeed, this is easily one of the best sounding soundtracks in the entire SNES library, such is Wise’s mastery of the single-cycle wave samples he has created for this project. Diddy’s Kong Quest is also considerably more colourful than its predecessor. Just sample “Hot-Head Bop”, which moves the soundtrack’s melodic content surprisingly close to 90s rock. Indeed bopping along with a distinct pop ballad feel, the track doesn’t forget to underscore its sweltering location. “Bayou Boogie” has great fun translating the oppressive atmosphere of its setting into music. And when Wise convincingly emulates the sound of “In the Air Tonight”’s Roland CR78 drum machine, it is not merely an exercise in pastiche, but only increases the humidity-drenched, claustrophobic mood. The biggest surprise here is “Disco Train”, which takes the Donkey Kong Country franchise into new territory. Far from an exuberant dance out though, the track feels more like an eerie take on mid-90s techno. An amazingly well-synthesised bass drives a disconcertingly siren-like lead on a track one would expect to find on a 32-bit futuristic racing game from the same year. Add to all this “Flight of the Zinger”’s jittery tension that subtly undermines the generally calm mood of the game’s stage themes, and the Donkey Kong Country 2: Diddy’s Kong Quest soundtrack emerges as one of the most atmospherically and emotionally rich game soundtracks ever written.